Keep the look you love in between salon visits with our extensive line of take home products professionally recommended by your stylists! 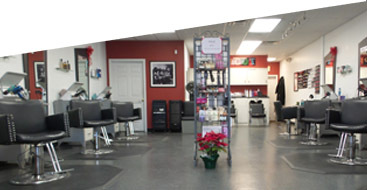 We proudly carry the following brands: Shellac, Nioxin, OPI, ISO, Paul Mitchell, Sebastian, Redken, Woody’s, TIGI, John Amico, American Crew, Aquage, Mixed Chicks, It’s a 10, Paul Mitchell, Morrocan Oil, My Amazing Blowdry. Praised by everyone from celebrities to beauty bloggers and veteran hair stylists, Mixed Chicks® is a critically acclaimed solution to all textured hair woes. Accentuating your natural hair type while keeping it well-moisturized and in place (without any greasiness or stickiness), Mixed Chicks® products keep baby hairs at bay, curls hydrated, and frizz to a minimum. Cruelty-free and hair-healthy, these products show almost immediate results. Embrace your natural beauty and excellence with Mixed Chicks. Moroccan argan oil is all the rage for hydration and repair, and for good reason. With plentiful minerals and antioxidants, this miracle oil revitalizes and beautifies hair. With a wide range of Moroccanoil products to choose from, there is something for every hair type from the thin and curly to the straight and full.